The fact that I loved this book will come as no surprise. Rachael Johns has fast become one of my favourite Australian authors and her books have introduced me to rural romance, a genre that I didn't normally read, now I can't get enough of them! In Outback Blaze we return to the lovely community of Bunyip Bay to find out Ruby's story. Ruby has returned home to pick up the pieces after a failed relationship and get her life back on track, but a whole new set of problem occurs when her parent's business is destroyed in a suspicious fire. Tensions and gossip flare up in the wake of the tragic fire and police officer, Drew Noble is determined to find out the truth behind the fire, what he isn't prepared for are his feelings for Ruby. Outback Blaze is more than your typical rural romance, the mystery/suspense element makes this book a genuine page turner. I loved the relationship between Ruby and Drew, it was not rushed and was realistic. 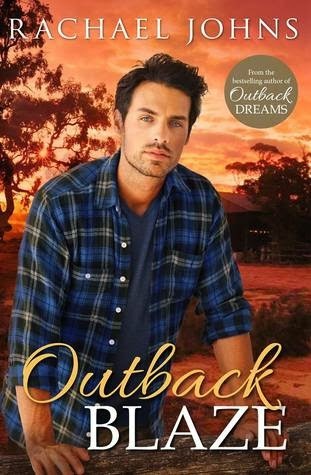 Outback Blaze was a great read, definitely my favourite Rachael Johns book so far, her books just seem to be getting better and better. I am now eagerly awaiting the release of her next book, Outback Ghost! Just a final word of warning, if you are a bit of a softie like me, you may need some tissues while reading this book!